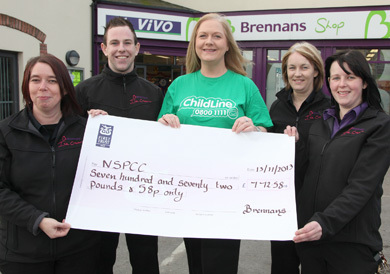 THE NSPCC Northern Ireland has cheered on staff from Brennan’s VIVO store in Dundrum after they raised £772.58 for the charity’s ChildLine Schools Service. The NSPCC aims to end cruelty to children in Northern Ireland and the UK by fighting for their rights, listening to them, helping them when they need us and making them safe. The staff at the Dundrum store completed this year’s Mournes HACK challenge and presented a cheque to the NSPCC’s corporate fundraising executive Marie McGuckin. Making the presentation pictured below to Marie are VIVO staff members, from left, Stephanie Marner, Brendan Cunningham, Linda Murnin and Aisling O’Neill. Marie Madine, missing from the photo also took part. You can show your support for local children and families by texting NIChild to 70744 to make a donation of £4. The Vivo team make a presentation to the NSPCC. A team of five intrepid trekkers from Brennan’s VIVO store in Dundrum have conquered the Mournes to raise over £700 for NSPCC’s ChildLine Schools Service at the Hike Against Cruelty to Kids (HACK). The seasoned HACK walkers get their hiking boots on every year to support charity, and this year was no exception, with the team raising £772.58. Conor McKibbin, VIVO Dundrum store owner, said: “We are very proud to support the ChildLine Schools Service in Northern Ireland and love getting involved with the HACK every year. Thanking the team, NSPCC corporate fundraiser Marie McGuckin said: “We are so grateful for VIVO Dundrum’s on-going commitment to the HACK challenge. “The event was a huge success, in no small part due to the efforts made by the walkers, and the staff at VIVO, Dundrum take on the challenge every year to raise vital funds for our ChildLine Schools Service, which has been set up to give primary school children the awareness they need to recognise abuse and to seek help sooner. The mountains may have been conquered, but you can still show your support for local children and families by texting NIChild to 70744 to make a donation of £4 to the ChildLine Schools Service. Look out for details on the 2014 HACKs on www.nspcc.org.uk/hack.